Idris Ackamoor and his jazz ensemble The Pyramids began performing together in the 1970s when they were students at Antioch College under the mentorship of renowned pianist Cecil Taylor. After releasing several widely acclaimed “space-age” or “spiritual” jazz albums, the group disbanded in 1977. When a new generation of music lovers discovered The Pyramids recordings and began clamoring for more, Ackamoor decided to reconstitute the group in 2012. An Angel Fell is the third release from this new ensemble, led by Ackamoor on alto, tenor sax and keytar, with Sandra Poindexter on violin and sharing lead vocals with Ackamoor. Other group members (at least on this album) include David Molina on guitar, Skyler Stover on double bass, Bradie Speller on congas, and Johann Polzer on drums. The album opens with “Tinoge,” which seems to be a reinterpretation of The Pyramids’ previously released single, “Tinoge Ya Ta’a Ba,” the latter recorded in Ghana with Kologo artist Guy One. “Tinoge” is a compelling track that features the same driving rhythm and percussion, with guitars replacing kologo and an extended free jazz sax solo replacing the vocals. 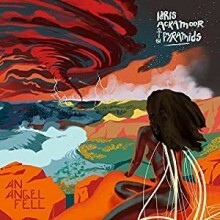 Next up, the title track “An Angel Fell” capitalizes on the “cosmic jazz” theme, with distorted vocals punctuated by spacey, electronic riffs. The Sun Ra tribute, “The Land of Ra,” follows in a similar vein, as distorted call and response vocals segue into a steady Afrobeat groove over which Ackamoor seductively blows his horn. Suddenly, their celestial universe is disrupted by what might be described as a magnetic storm (i.e., all hell breaks loose), but as the piece progresses and harmonies resolve, equilibrium returns. Two message songs are included on the album. The first and most emotional is “Soliloquy For Michael Brown.” Ackamoor’s sax literally screams in anguish over an underlying conga rhythm. As anguish turn to grief, the bass riffs on a melody reminiscent of the spiritual “Joshua Fought the Battle of Jerico,” then intertwines with violin and guitar as the track draws to a close—but there’s no closure. “Message to My People” is a warning about climate change and global warming, with Ackamoor sounding the alarm on the alto sax and the group responding as if their life is imperiled. “All I wanted was a chance, to live my life like anyone” chants the chorus, but the raucous conclusion leaves little doubt the world has come to an end. Concluding with the uplifting song “Sunset,” the Pyramids provide a glimmer of hope and “a prayer to save our world.” The struggle is still very much present, with Ackamoor’s sax sounding another warning as the chorus sings, “The sunset is on the way.” End of the world or just the close of another evening, you decide. An Angel Fell is a brilliant and intense album, with wild bursts of sound. The socially conscious project takes the concept of spiritual jazz to the next level, but in a manner that is still very approachable.